IGP Riojan chorizo is one of the most traditional foods in Riojan gastronomy. Its 100% natural ingredients give it that good old taste that we like so much in the kitchen as well as the most recent dishes. You only have to add a little imagination to discover that there is life beyond stews, sandwiches or “patatas revolconas”. 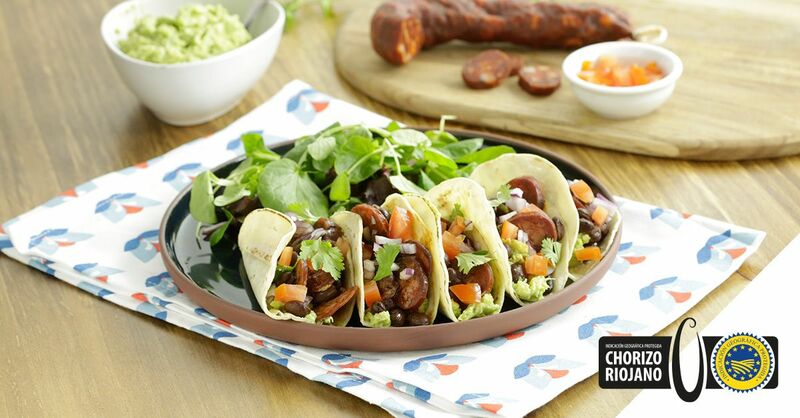 If a few weeks ago we shared with you this recipe for an exquisite fried kale, today we want you to try these delicious Mexican tacos that we have accompanied with avocado, pico de gallo, cilantro and our star product: IGP Riojan chorizo. You will be surprised by the ease with which a flavor that has always accompanied us can fuse with cuisines as trendy as the Mexican. So… don’t miss this video! Sauté the chorizo in slices in a frying pan. Add beans and remove from heat. Crush the avocado and mix with the lime juice and salt to taste. Spread the tortillas with the avocado and place the beans with the chorizo on top. Finish with the pico de gallo and a handful of chopped cilantro. By the way! If you’ve been left wanting more recipes with IGP Riojan chorizo, you have to have a look at these potatoes stuffed with Riojan chorizo, our mini Riojan chorizo quiche or the exquisite mushrooms stuffed with Riojan chorizo. It will make your mouth water!